The first edition of this book is regarded as a classic in its field. 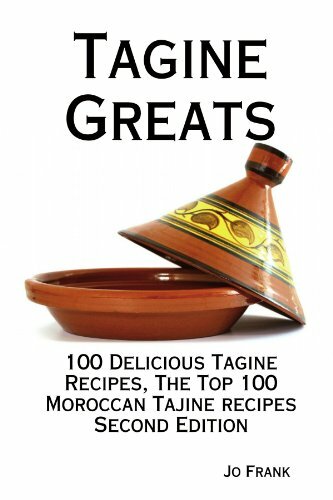 Now, in an expanded and updated version with 20 NEW recipes, Jo Frank once again presents a step-by-step guide to the World's best Tagine recipes. If you own a tagine, you need this book. If you don't own one, you are missing out. They are a great way to cook and the food is simply beautiful. If you love Moroccan food then this recipe book is a must have. You'll love this book, the recipes are easy, the ingredients are easy to get and they don't take long to make. There is an excellent recipe for Tagine of Okra and Tomatoes and a wonderful Vegetable Tagine with Sliced Apricots at the back of the book. My favorite tagines are the slightly sweet ones with dates, prunes, apricots and the different types of nuts that are added toward the end of the cooking time. There is also a wonderful Lamb Tagine With Apricots, Olives and Buttered Almonds. There is also a really nice minced beef tagine with wonderfully tasting preserved lemons which are very easy to make yourself. This book will also give you enough inspiration to experiment with different ingredients since you'll find the extensive index to be extremely helpful. The recipes are superb. Wonderfully easy to put together and you don't have to make or purchase a ton of condiments before you have a chance to play with them. Yummy!! Definitely great comfort food during winter. And don't forget the couscous! This fabulous book trumps the first edition, which is a bestseller.